In whatever sectors or industry that we are into, it is common that reports are created, may it be by the top management or the rank-and-file employees. Reports are created for different purposes depending on the company. Some might need a report to monitor their operations while others need a report just to comply with regulatory requirements. Other important uses of a report is to implement policies and procedures, to obtain funding, to document work, and to guide decisions. Indeed, creating a report is vital for any establishment in order to make their system organized and systematic. 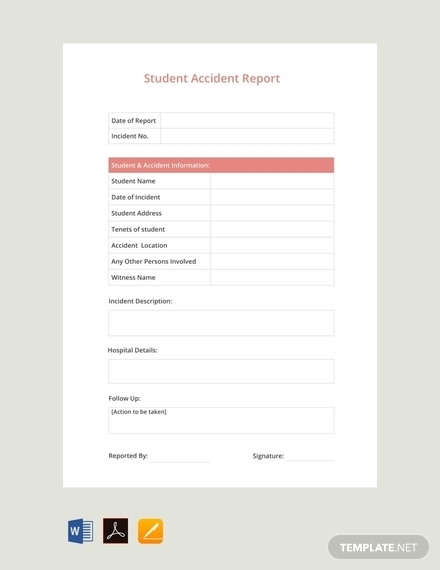 Regardless of the purpose of your report, it must be created legibly and professionally and must present information accurately. 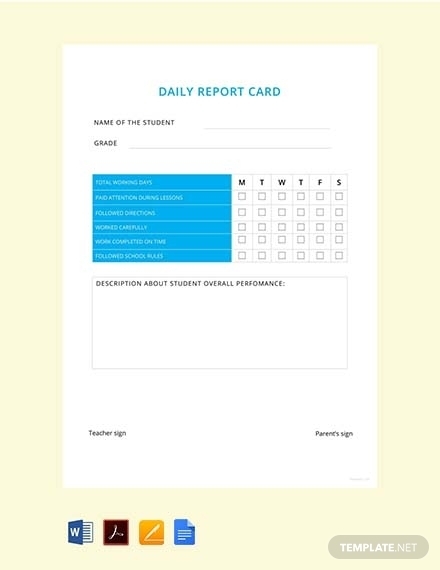 Not sure how to write a report? 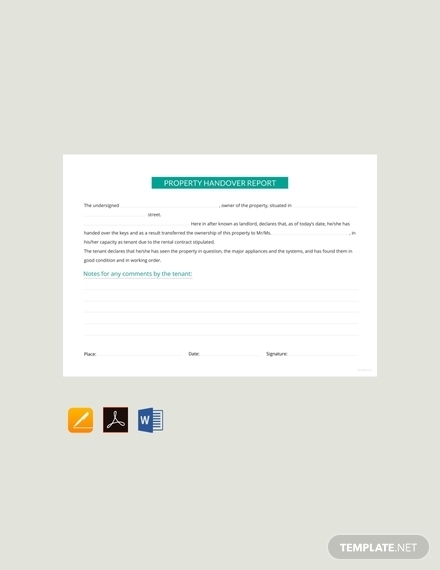 You can refer to the report templates and examples presented below. Anyone can create a report, but it takes one with experience and proper knowledge about the basics of a report to create a well-crafted, good report. There might be a lot of different variations of a report, but certainly, all reports are similar in terms of structure and elements. Hence, we are providing you with the important elements that comprise a report. 1. Letter of transmittal: Unless a certain report has a cover, the first thing that a reader usually see in a technical report is the letter of transmittal. This is a letter that is addressed to the person who commissioned the report, reminding the person about the purpose of his request for a report as well as the details of the request. It also briefly describes the report and end on a positive note.You may also see narrative report examples. 2. 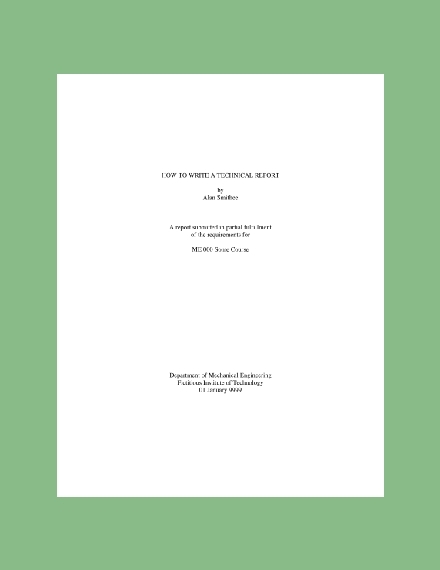 Title page: Typically, the title page consists of the title of the report, which is usually rendered in bold and centered and is positioned in about 1/3 of the way down the page. It has more white space on it than print. The title statement must be presented title case, and below it is/are the name/s of the author/s as well as the submission dates. Remember that the title, author name/s, and submission dates must appear on separate lines on the same page and are placed at the center of the page. This page must look balanced, and in order to do so, blank lines between entries may be needed if the entries seem to cluster together. 3. Table of contents: After the title page is the table of contents. At the top of the page, the words “Table of Contents” must be centered. Below it are the major heads that are distributed through the report, which must reflect the hierarchical structure or format of the report whereby the first-level heads are aligned on the left margin on the report, the second-level heads are indented, and so on. The page number of each title head must also be placed on the right margin in the same line as the head that it corresponds. 4. List of illustrations: For tables or figures, you must list them in a separate table of contents. This table of contents is called the list of illustrations. It also has a title at the top and the names of illustrations on the left column with their corresponding page numbers at the right. Typically, it is divided into two parts: a list of tables and a list of figures. The list of figures may consist of any graphs, drawings, or photographs that are used in the report. 5. Abstract or executive summary: It is recommended that you write the abstract or executive summary last. This is because this consists of the summary of the report; hence, you need to gather all the parts of your report first before you can come up with the executive summary. 6. The introduction and sections: On the main body of a report, you can find the introduction and the sections. The introduction comprises the purpose statement, problem statement, and scope statement. The purpose statement, evidently, states the purpose of the report. The problem statement describes the problem or the situation that called for the writing of the report. Lastly, the scope statement defines the scope or coverage of the report. These different sections are written as the chapters of the report and are usually shorter than book chapters. A topic sentence must be the starting sentence of a section which explains the purpose of such section. The following sentences of that section must support the topic sentence or develop the topic sentence in detail. 7. References: This is a list of all the outside sources used in the report. A report must follow a certain reference style depending on the nature or type of the report. The typically used reference styles are Modern Language Association (MLA) style, American Psychological Association (APA) style, Turabian style, and Chicago style. There are a lot more reference styles that you can use for your report, so choose one that perfectly fits your purpose. 8. Appendices: This element appears at the end of a report and typically contains materials that are too bulky for the report proper. Oftentimes, extensive data tables or design drawings are placed on the appendix if they break up the smooth flow of the main report when inserted in the main body. Appendices are usually labeled using letters, that is, Appendix A, Appendix B, and so on. You may also see project report examples. 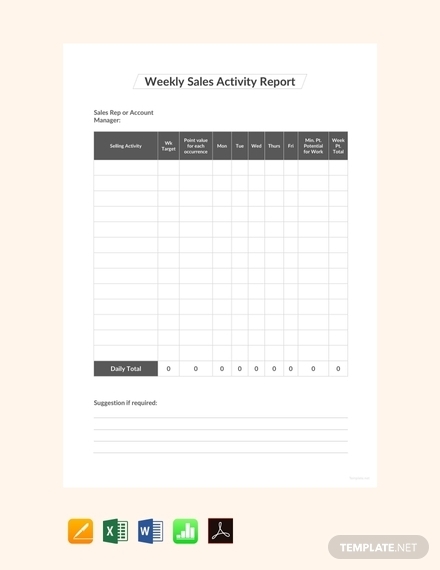 It is important that you will know how to create a report because it can be used for different purposes inside and outside your organization. Here are some simple steps that you can follow. 1. Know your purpose and your audience: Knowing the purpose of your report provides you an insight on how to start your report. What issues will your report tackle? Who are your target readers? These questions might help you define your purpose which will lead you to create a fixed objective. Knowing who your readers are will also help you adjust your writing style according to your audience. 2. Gather data: In order for your report to be credible, you must gather factual data that will support your point. Summarize your data into charts, graphs, tables, and illustration so the readers can easily understand your point. You may also see investigation report examples. 3. Develop a detailed discussion: After establishing your main idea as well as your supporting data, you must formulate a detailed discussion to explain your point further and for the readers to understand more on your topic. 4. Finalize and revise: Finally, when you are done writing the content, do not forget to recheck and proofread everything. Make sure to spot for spelling and grammar mistakes, and ensure that there are no important information missed and that your points are not confusing or ambiguous. Do not hesitate to make lots of revisions for it is normal in writing a report. Revise your work until you can no longer spot any undesired parts or errors. Include visuals: Visuals can greatly help in making people easily understand your report. 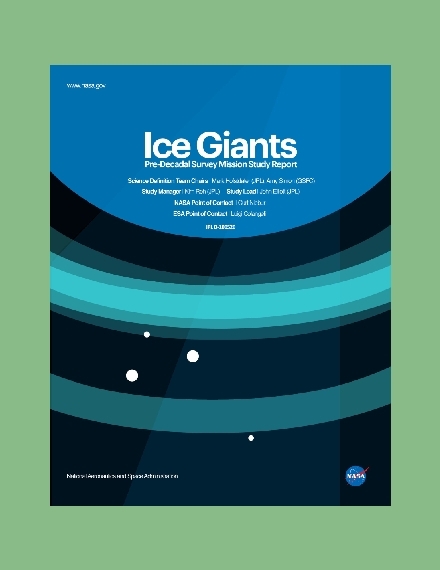 They serve as a summary to your text in the form of graphics and illustrations. Have a logical flow of ideas: There must be a natural flow of ideas from your introduction, to your body, and up to the conclusion. They must also have a relationship that is easy for the readers to understand so your report would be interesting to read. Check out expense reports. Be concise: Including flowery words and adjectives do not apply in writing a report, for a report must be written concisely and precisely. Moreover, you must also be consistent with your professional writing tone. The use of active sentences is also highly encouraged for your audience to be constantly engaged. Consider your typography: The type of font that you are using as well as the arrangement of words is also vital in keeping your audience engaged, so make sure that you are considering these simple things too when writing a report. You may also see consulting reports. 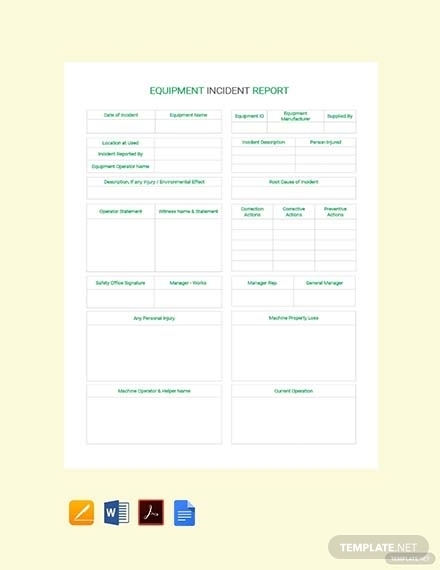 According to its purpose, a report can be categorized into different types. Knowing these types would help you create a report that is fitting and appropriate for your current needs. Below are the commonly used reports that you must know. Formal or informal reports: Primarily, reports can be classified as formal or informal. 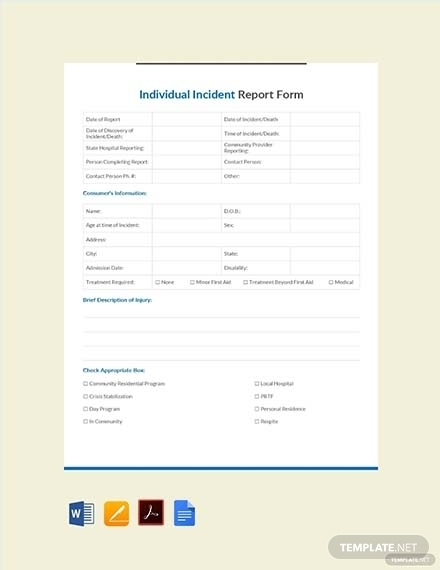 Formal reports have a structure and contain detailed information, objectivity, and organization. On the other hand, informal reports are usually short and use a casual or natural language. Periodic reports: These are issued on a regular basis or on scheduled dates. Typically, they are upward directed and used by the management and other key personnel. 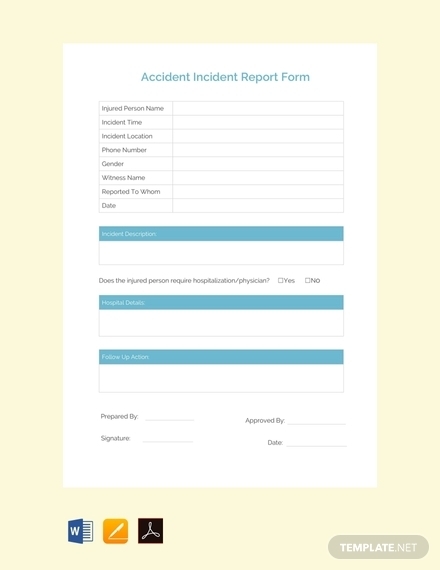 For uniformity of these reports, pre-printed forms and templates are usually used. An example would be monthly reports. 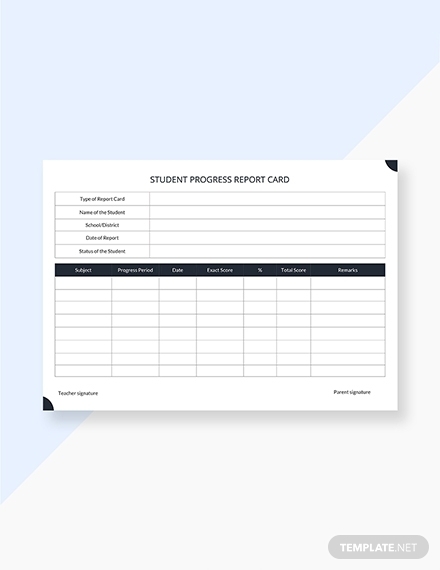 Short or long reports: It might be easy for you to determine the classification of a one-page report and a thirty-page report. However, if you are asked to classify a fifteen-page report, where would you place it? 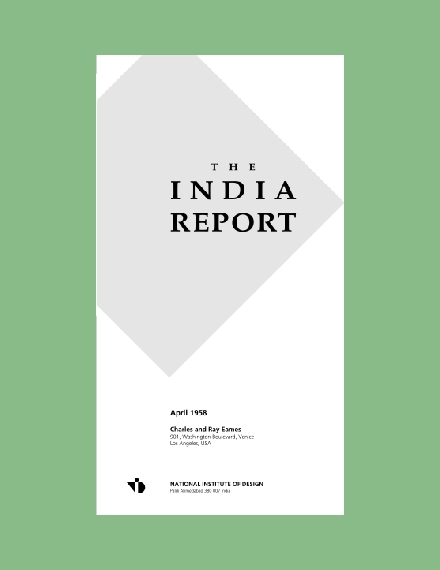 A short report or a long report? One way to determine if it is a long or short report is its characteristics whether it is a formal or informal. 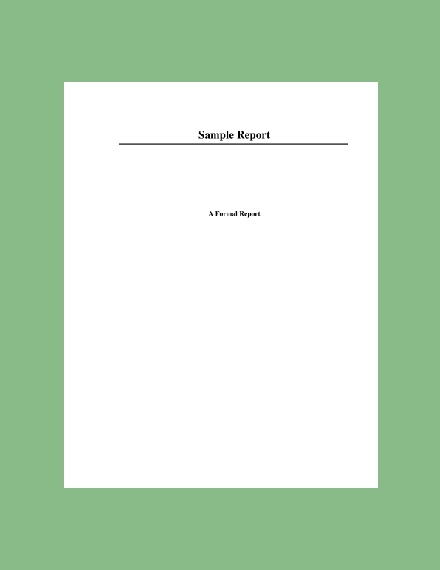 As the report becomes longer, it usually takes on the characteristics of a formal report. Vertical or lateral reports: Vertical reports are those reports whose main concern is on upward or downward the hierarchy of a certain organization such as those reports that contribute to management control. On the other hand, lateral reports are those that assist in coordination in an organization between units of the same organizational level, for example, production and marketing departments. Internal or external reports: Internal reports are prepared or used within the organization while external reports are for purposes outside the organization. Informational or analytical reports: Informational reports are those reports that carry objective information from a certain area of an organization to another. 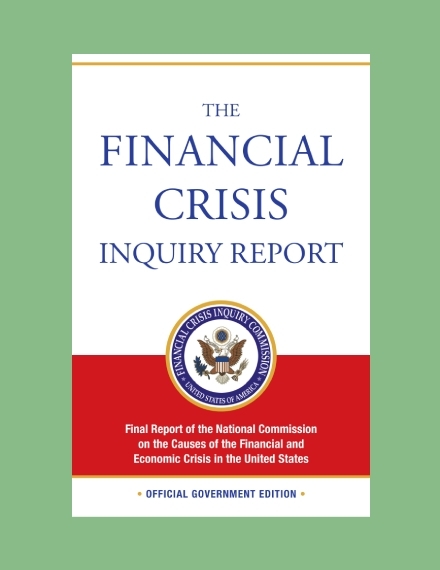 Examples of informational reports are annual reports and monthly financial reports. Meanwhile, analytical reports attempt to figure out certain problems. Examples are scientific research and feasibility reports. Proposal report: This document is prepared to provide details on how an organization can meet the needs of another. When a certain organization needs a proposal, they usually issue RFPs or requests for proposal which specifies their need. Interested suppliers must address or answer their request through a proposal report. Functional reports: This includes marketing reports, financial reports, and accounting reports. Reports of this type can be classified according to their structure which are as follows: pre-printed form, letter, memo, and manuscript. What are examples of reports to monitor operations? What are examples of reports to comply with regulatory requirements? What are examples of reports to guide decisions?